Does this Parakeet Need a Haircut? Excuse Me, Is that a Pom-Pom on Your Head? 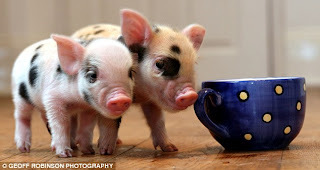 Teacup Pig Craze: Cuter than Your Average Oinker! Have you ever seen a mutant parakeet? Me either... until now. Meet Whippet! Whippet sports a very unique and special birdie 'do. In fact, he's the shaggiest parakeet I've ever seen! I wonder if he very well underneath all those luscious locks. How about a funny talking parakeet next, please? It's always hard to find good help around here. Imagine finding help that's not only good... but cute, too! Personally, I hate washing windows, so I'd be willing to pay this kitty whatever she's charging. Or, at least, maybe she can train Pimp and Moo? More kitty lickin' good, please. So there's a pom-pom on my head. So what? It's not all that uncomfortable. And maybe if I pretend it doesn't bother me they'll just leave me alone... Or maybe they'll pile more pom-poms on me. More cats with stuff on their head, please. 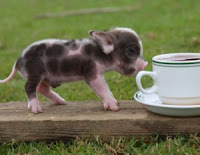 This morning I realized what was missing from my life... a teacup pig! 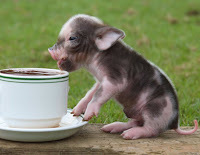 A teacup pig looks just like a regular pig, except smaller and cuter, and I want one. 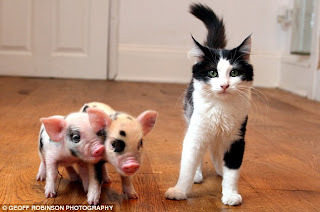 If I got a teacup pig, he'd be smaller than my two kitties -- even when he's full grown! 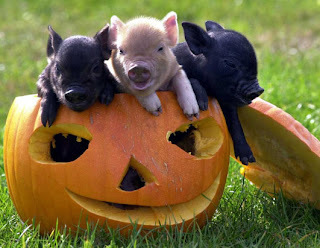 I mean, look at the teacup pig cuteness! 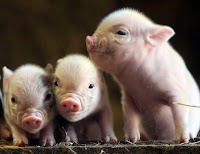 These are a special breed of piggies, bred to be "micro-pigs" that are only 9 ounces when they're born... Pigs that are tinier than teacups? Yes! 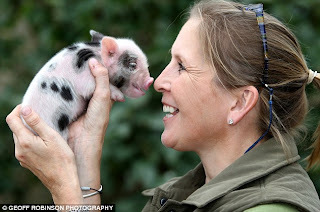 *Top three pictures from Daily Mail. Summer may be over, but that's no reason to stop eating watermelon... especially if you're a cute Guinea pig! Does anyone else think Guinea pigs are some of the cutest eaters ever? Two Cats Tuesday again already? Yay! 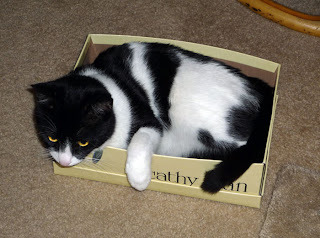 This week we're talking about something very near and dear to Moo's sweet little cow-cat heart -- boxes. 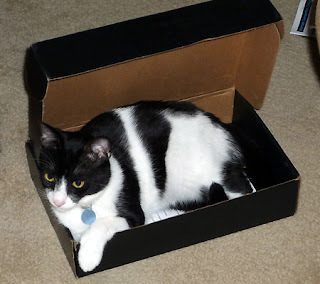 I know all cats love boxes, but Moo luuuurves his boxes. Here's Moo when he was working on "adopting" me. He was still outside, camped out on my back porch making his case to come in for good. (He won, of course.) 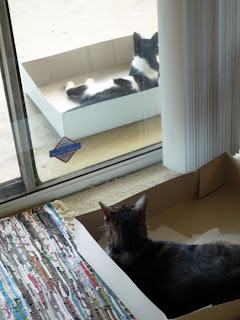 This is Pimp showing him how boxes are done. 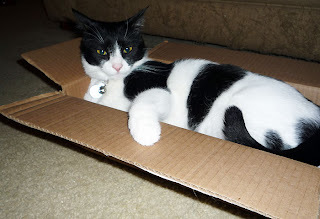 Once he got in, he quickly learned that home is where the box is. This box originally had shoes in it. Than goodness I got those pesky things out of there... they were in his way! 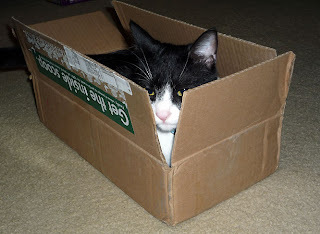 Boxes are also good for being sneaky in. This one came from our friends at World's Best Cat Litter. There was a bag of litter in there... again, good thing I got it out of there ASAP. 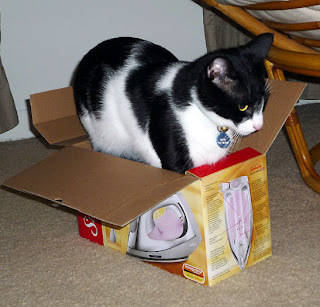 Sometimes objects are smaller than they appear -- he gave this box a valiant effort and, I'm proud to say, eventually squeezed himself snugly in. 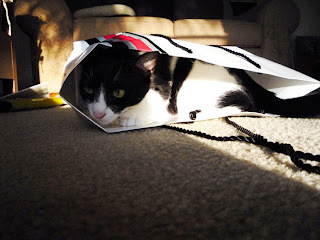 And sometimes (just sometimes), when there's no box around, a bag will do. I totally forgot about these kinds of slides until I saw this video... Remember the slides with a bunch of rollers like this?! Anyway, on to the cuteness! This silly doggie has managed to make multi-tasking a cute thing -- a fun wheeeee! down the slide and a good scratch at the same time. Fun! More dogs on slides, please.